MAXIMUM INK: It must be interesting to experience the nature of your audiences changing over time. JOE PERRY: Oh yeah. It’s not quite at drastic as it was 20 or 30 years ago. America has become more homogenized with all the malls and different things, national television stations and that kind of thing, so you have to dig a little further to see those kind of idiosyncrasies in each part of the country. That’s one of the reasons we stopped touring by plane and started touring by bus: You get more out of it, and it’s just amazing. MAX INK: What is the best part of going on the road? PERRY: Well, this is the most amazing country on the planet, and if you get to travel by bus, which we do, you get to see a lot of it, so we take advantage of that. I love all different parts of the country, because they’re just so unique because of the weather and the people, it’s just amazing. It’s never boring. MAX INK: Balancing family and a rock band is not a simple task. PERRY: Well, most of the time we all travel together when the band is on tour. We always find time to do stuff on the road; my sons and I get together with some friends and we like to water ski. My wife and I like horses, and we go off and visit different horse farms and friends around the country when we’re on tour. MAX INK: Some of your songs are decades old. How do you sustain the energy in them? PERRY: Rock and roll is rock and roll, and good bands are few and far between. I mean, there is nothing that is going to change the shape of a Les Paul or the sound of a Marshall amp, but it still has to be played well, and I just think it keeps working. Getting the music to sound original and fresh, that’s the trick. Take “Dream On,” the thing about that song is that the audience keeps it fresh for me. When we first start playing it and they start cheering, that’s what keeps it fresh. MAX INK: In terms of the future, where is Aerosmith headed in the studio? PERRY: We have a few ideas. Unless you get a hit, most of the material will be left by the wayside, because most of the fans want to hear the stuff that was popular when they first started getting into music. Songs of the ‘70s, ‘80s, or early ‘90s seem to be the backbone of what people want to hear from us. That’s why, if you can have a hit or two and that gets driven into the mainstream, it can become a classic. Fortunately we’ve been able to do that on a pretty regular basis, and that’s what we try for. It doesn’t mean we give up on the rest of the record, but we are aware of what the industry is about, so most of the time we’ll try to get a couple of singles and the rest of the time, we’ll make records for our fans. MAX INK: Shifting gears a bit, in your experience, which do you find more important in music, the lyrics or the instruments? PERRY: I think it’s the music. I think that bad music won’t cover for bad lyrics. But I think if the music is right and the melody is right, you can get away with bad lyrics. If the music is bad and the melody is bad, then good lyrics are going to be tough to listen to. MAX INK: I guess that’s why they call music the universal language. PERRY: [Laughing] Well, it sure is. One of the things I noticed early on was that lyrics didn’t matter that much when we played in Japan. A lot of guitar players have such big careers in Japan because they can go over there and it is a universal language, people aren’t relying on being able to understand the lyrics. I mean, how many rock bands have really had international success? It’s hard, you know, because rock is such a blues based style of music. I think it is just something about the English language that lends itself to the rhythm and the cadence of blues music. Like, I’ve never really heard a good French blues band that has made it to international or even national prominence. 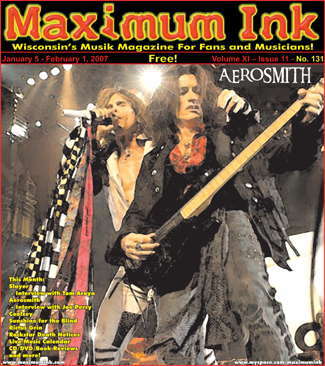 MAX INK: A lot of people would argue that the kind of rock and roll the Aerosmith grew up and thrived in, is more or less a dying breed. PERRY: I think the pop music changes, but there is still that undercurrent of every kid band and garage band in America, always playing the roots, and that hasn’t changed. Some grow their hair long, some short, but the sound of the music seems to stay the same. There is something elemental about it that will not change. MAX INK: True, but the attitudes of rock bands have definitely changed over the years. PERRY: Well, there was more of a rebellious air in the late ‘60s, music was really a counterculture rallying point. Now it’s not perceived as that. Now rock and roll isn’t scary, you hear tons of rock and roll on TV, mainstream commercials, you hear a lot of electric guitars and big kick drums all over the place. It is everywhere. It has become iconic, whereas in the ‘60s and ‘70s, it was a political rallying point of us against them. It didn’t matter if it was about straight people, against the Woodstock nation, or if it was hard rock and MC5, or if it was Ritchie Havens singing about a motherless child; It was all our kind of music. I don’t think you have that anymore. That’s why I think classic rock is having such a resurgence; I think it has finally gone long enough that it is not your mother’s music, it’s beyond your grandfather’s music, it’s just great music. I mean, there was one Led Zeppelin, and there will never be another one and then their music stands up today next to anything the White Stripes, Franz Ferdinand or any of them have done. Not to take anything away from those bands, because they’re out there trying to make their own mark, but I still believe that the great songs of any era will always sustain. MAX INK: Has being involved in music and the industry for so long, and experiencing all the different musical movements of the past decades, given you some insight as to what to predict will come of rock music? PERRY: No, I think that’s what keeps it excitingyou never know where rock is going to go. I know Aerosmith will never be the next new thing, but there’s always a chance we’ll have another hit single, and that’s always something to strive for. For example, this next record is really going be a challenge, because we are going to try and pull some of the material that we’ve had on the back burner and put it out there. It is an interesting experiment, because no matter what year it is, people tend to like the “old sound.” And so we’re going try to bring out some of the riffs that were actually written during those eras to the new record. I know I’m curious to see how it’s all going to play out. MAX INK: Out of all the bands in America, and in the world, why has Aerosmith stood the test of time? PERRY: Well, I think if you want to get a little metaphysical with the balance of energy, why we’re still here, I think there is this feeling of the fact that we came through everything we’ve come through and in some ways that’s just our example of being resilient and being able to come back. We have gotten so much from the fans and a lot of our success from being lucky and fortunate. So we try to give some of that back, and we’ll get a lot of letters from people that say you’ve been an inspiration for overcoming adversity. That’s why I think we’re still here. And so to keep up our end of bargain, we’re gonna keep delivering.